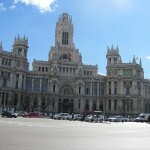 Plaza de Cibeles is a beautiful square located in one end of Gran Via (metro stop: Banko de Espana). 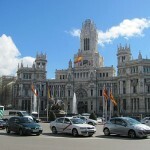 The square has become a symbol of Madrid with the Cibeles fountain in the middle of the square and the Palacio de Comunicaciones in the background (as seen on the picture on the right). The latter is today the office of the mayor of Madrid. 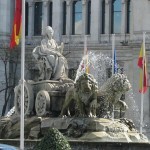 The Cibeles fountain was made in the end of the 18th century, and it portrays the goddess Cibeles sitting on a chariot pulled by two lions. If you walk towards Plaza de Cibeles from Gran Via you can reach Paseo del Prado with all its art museums walking to the right. 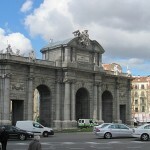 If you walk straight forward you will arrive to Puerta de Alcalá, a Neo-classical monument at Plaza de la Independencia. From there it is easy to walk into the El Retiro Park.